Are you thinking about a cycling holiday this Summer with family and would like some activity other than cycling? Provence may have the answer. 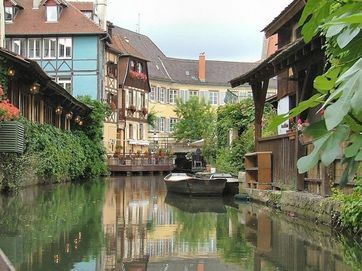 It is an easy, flat cycle of 30km to Lagnes,Fontaine De Vaucluse or L'Isle S/La Sorgue.Both Lagnes and L'Isle S/Sorgue are only 5km from Fontaine De Vaucluse. to L'Isle S/La Sorgue.It takes about 90 mins to do the trip and there is a couple of slides to go down. A mini bus takes you back to the start and the bikes. On the approach to Fontaine De Vaucluse there is an adventure park for all ages from 6 years. Ropes are suspended between trees then by means of a pulley you can glide from tree to tree. Near to L'Isle S/La Sorgue is a cave at Le Thor 8km away. For some carefree easy cycling the Calavon Cycle Route is a former railway line. One end is in nearby Les Beaumettes.Currently the trail finishes east of Apt making the trail about 40km in length.The title photo is of the Roman bridge along this cycle route. Picture fairytale villages laced with cobbled streets and quaint painted buildings, perched at the edge of the river Rhine.